One of the largest historical forts in the world, Jaisalmer Fort stands tall defying the blows of all-conquering time. Built by the Rajput King Rawal Jaisal in the 11th century, the fort is a stronghold amidst the vast expanse of golden sands. The backdrop of Jaisalmer’s desert beauty, it had witnessed many battles since the inception of its foundation. Made of yellow sandstones, the fort experiences a change in its color from bright gold to soft gold with the passing of the day from sunrise to sunset. That is why it is nicknamed “Golden Fort” or “Sonar Qilla”. The Academy Award winning Satyajit Ray had shot one of his famous detective films here. Another highlight of Jaisalmer Fort is the blend of Rajput and Islamic architectural styles in the construction. Take a walk through Manak Chowk, the chief marketplace in the town. It was a bustling trade hub during the royal times of Rajasthan. Traders from the Middle East countries used to trade here. There are delicately sculpted beautiful havelis (palatial buildings) around Manak Chowk. Turbaned men with twisted mustaches, and colorful ghaghara clad women from the outskirts of Jaisalmer make the market look resplendent in the glories of the past. The women adorn themselves with ivory and silver ornaments. On visit to the market, you will feel the ancient charm of the places that you have heard about in fables. 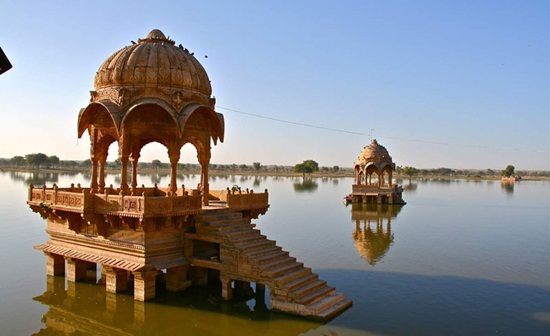 Gadi Sagar Lake used to be the savior of lives in the bygone eras when Jaisalmer was grappling with water scarcity. The lake was built as a reservoir to store rainwater which was supplied across the city in times of water crisis during summer. What makes Gadi Sagar Lake a must-see tourist attraction is the majestic landscape dotted with temples, shrines, gardens and ghats. Surrounded by shrines and temples, the lake has been consecrated as part of pilgrimage in the city. For the idyllic setting with space for boating, it has come alive as a suitable picnic spot. 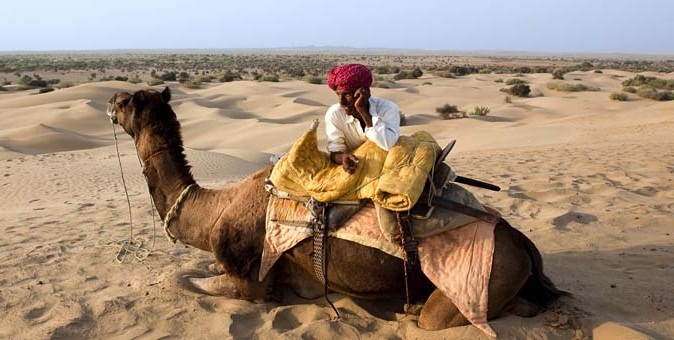 Jaisalmer is as much known for its desert beauty as for its royal history. The picturesque desertscape is dotted with sand dunes running miles. The wavy dunes make the desert a scenic landscape. A camel ride across the sand dunes gives the thrilling feel of a roller coaster. When a whirling wind blows over the dunes in the backdrop of the twilight sky, the ambience feels magical, musical and mirthful. The joy of sleeping on the dunes, under the starry sky and in the open is no less than a divine experience. 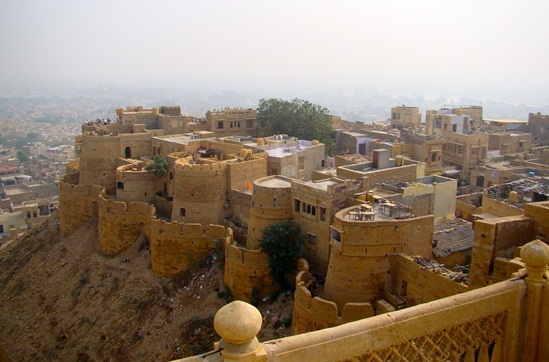 Jaisalmer is a city of richly decorated mansions or havelis. Most of the mansions were constructed in the 18th and 19th centuries. The most famous mansion is Patwon ki Haveli, built by a wealthy silver merchant Guman Chand Patwon, in 1805. The mansion consists of five houses with sixty balconies and sprawling courtyards. 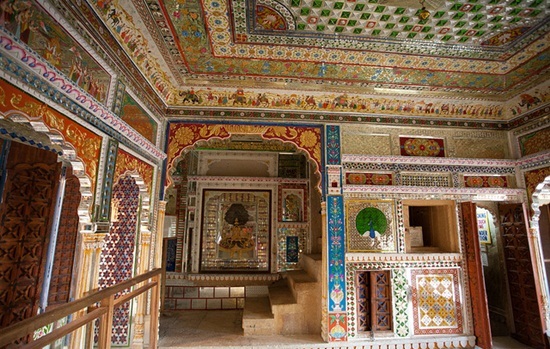 The ceilings and walls are lavishly embellished with delicate mirror work, the beauty of which is inexplicable. Jaisalmer Desert Festival 2019 is scheduled to run from February 17 until February 19. Do respond to the call of sand dunes, the Golden Fort, and the centuries-old mansions in Jaisalmer by booking your air travel to Rajasthan on IndianEagle.com. Jaisalmer is an overnight train journey from New Delhi, Jaipur, Jodhpur and Udaipur. It is a 3 day long exclusive festival of dance, music and handicraft. It showcases the Rajasthani handicraft items, sarees and jewelry etc.